Find below the best city hotels list in Rocamadour (France). Its provide by Booking.com the most popular Hotel booking sites with over 130 000 affiliate best hotel in the world. 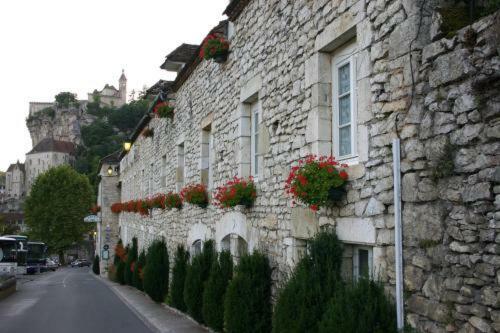 The Hôtel Du Roc is located in the historic hillside town of Rocamadour, in the Lot region. Each guest room has a private bathroom, TV and free Wi-Fi. The Roc can serves a buffet breakfast in the hotel dining room. Located close to Rocamadour, this 17th-century mansion is set in a large, peaceful park and boasts panoramic views of the surrounding valleys. Free Wi-Fi is available in common areas. This 2-star hotel is located at the highest point of Rocamadour, 50 metres from a viewpoint offering views of the medieval city. It provides modern guest rooms with private bathrooms and free Wi-Fi access. Grand Hotel Beau Site, full of charm and character, is ideally situated in the heart of the medieval town of Rocamadour. Guestrooms are comfortable and unique in their décor. Some rooms offer a view of the terrace or the valley. Logis Hôtel Le Belvédère is a comfortable hotel in Rocamadour which has a view of the fortified citadel. The 17 rooms of the hotel are comfortable and have all the necessary equipments. Located on the uplands of Rocamadour, Hotel Bellaroc is just 12 km from the Padirac Caves. It features an outdoor swimming pool and offers views over the medieval city. The guestrooms at Logis Hotel Bellaroc come with a private bathroom.